Hillary Clinton keeps smearing Bernie Sanders as a sexist: Now she is reaching for the race card. First she suggested the Vermont senator was sexist. Now she’s reaching for the race card. 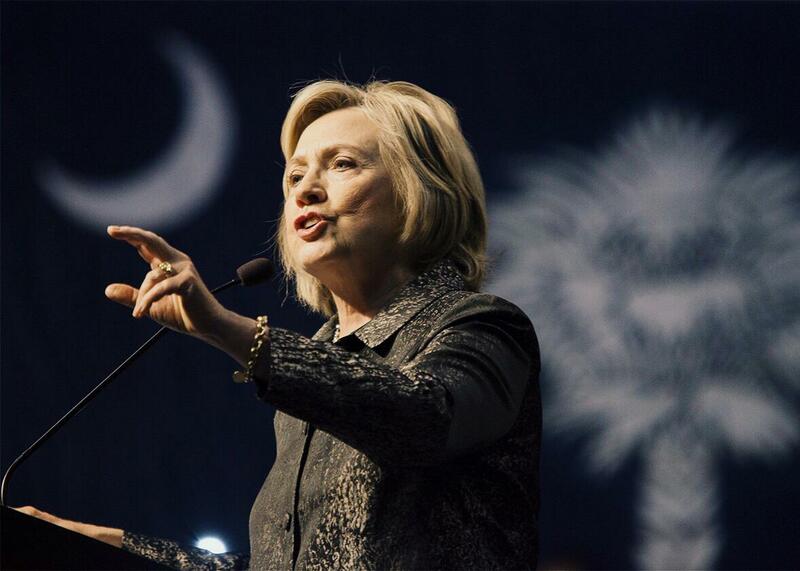 Hillary Clinton speaks to members of the International Longshoremen’s Association in Charleston, South Carolina, on Oct. 31, 2015. Clinton used her initial sound bite—“when women talk, some people think we’re shouting”—in at least six places. She posted it on Twitter, Facebook, and her campaign website. She also delivered it in three speeches: in Washington, D.C., and Alexandria, Virginia, on Oct. 23, and in Des Moines, Iowa, on Oct. 24. After that, I didn’t hear it, except in her interview in New Hampshire. I thought she might be done with it. But then, on Friday, she raised a new issue. In fact, it’s from the same moments of the debate that Clinton had already seized on. In the debate, Sanders began by saying, “As a senator from a rural state, what I can tell Secretary Clinton [is] that all the shouting in the world is not going to do what I would hope all of us want.” A couple of minutes later, Sanders told former Maryland Gov. Martin O’Malley: “We can raise our voices, but I come from a rural state, and the views on gun control in rural states are different than in urban states, whether we like it or not.” O’Malley insisted that the issue was “not about rural and urban.” Sanders replied: “It’s exactly about rural.” Only one other candidate used the word “urban” during the debate: former Virginia Sen. Jim Webb. A week later, on Oct. 20, Webb quit the campaign. So when Clinton, on Friday, spoke scathingly of people who call guns an “urban problem” but mean it’s a “black problem,” it’s obvious to whom she was referring. Now Hillary Clinton is doing to Sanders what her husband said was done to her. She’s taking Sanders’ remarks out of context and twisting them to breed resentment. You’ve got to twist the facts pretty hard to portray Sanders as a racist or sexist. But politically, it’s easy, because once you start throwing around charges of bigotry, the facts become irrelevant. You’re just another beautiful baiter. And you won’t be silenced.